Brocade is proposing a Dynamic Network Resource Manager (DNRM) blueprint to simplify the deployment and management of physical and virtual networking resources within cloud infrastructures. The goal is to enable OpenStack cloud environments to more easily access pooled resources in multivendor networks. 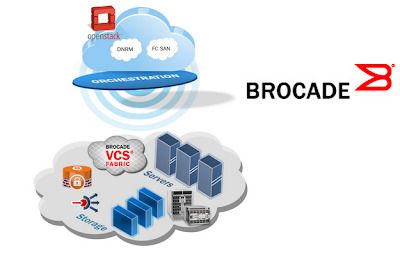 Brocade intends to present its proposal at next week's OpenStack Summit in Hong Kong. Continued work with partners of the OpenStack community to deliver DNRM capabilities as part of the Spring 2014 OpenStack release, codenamed "IceHouse"
Brocade is also updating several other OpenStack contributions in its continued drive toward open networking solutions. Brocade also highlighted the Red Hat Certification of the Brocade VCS Fabric plugin as part of RHEL OpenStack distribution. The Brocade VCS plugin is part of the current OpenStack Havana release. With it, OpenStack now has a single logical interface to the entire Brocade Ethernet Fabric instead of interfacing with individual switches. In addition, the company will support the next "IceHouse" release of OpenStack in Spring 2014 with Brocade SAN Fibre Channel, Brocade ADX Load Balancing as a Service (LBaaS) and an OpenStack solution with Brocade Vyatta vRouter plugins. "Public and private clouds are evolving from basic, homogenous entities to rich, service-oriented clouds that combine best-of-breed solutions, including both physical and virtual resources. To ensure these next-generation cloud architectures properly serve customers, Brocade is continuing to expand its investment and participation in open projects such as OpenStack and OpenDaylight. It is our belief that contributions such as the Dynamic Network Resource Manager equip customers to build the next-generation services cloud to deliver the flexibility and agility it needs," stated Ken Cheng, CTO and Vice President, Corporate Development and Emerging Business at Brocade. In October, the OpenStack community marked the eighth release of its open source software for building public, private, and hybrid clouds. OpenStack Havana introduces nearly 400 new features to support software development, managing data and running application infrastructure at scale. There were over 900 contributors to the Havana software release, a more than 70% increase from the Grizzly release six months ago. Two new projects, OpenStack Orchestration and Metering, were incubated during the Grizzly release cycle and are now available in the Havana release. 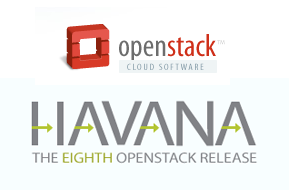 Application-Driven Capabilities – OpenStack Orchestration, now available as part of the Havana release, is a template-driven service for describing and automating the deployment of compute, storage and networking resources for an application. The new global clusters feature for Object Storage enables you to cut costs and improve performance by replicating and delivering data around the world, and the new QoS capability across Block Storage drivers allows you to guarantee performance requirements for an application. Docker support was also added to speed application deployment using containers. Improved Operational Experience – During this release cycle, significant effort went into increasing the breadth of functionality that is exposed through the Dashboard. A new team of user experience experts also contributed their time to improve the UI, workflows and productivity. OpenStack Metering, another new service in Havana, provides users with a single source of usage data across OpenStack services for activities like enterprise chargebacks and feeding systems monitoring tools. More Enterprise Features – OpenStack continues to mature and support enterprise-driven features such as end-to-end encryption across all Block Storage drivers, SSL support across all service APIs, new VPN and Firewall-as-a-Service capabilities, and support for rolling upgrades and boot from volume, which provides the foundation for live migration. Additionally, popular storage and networking providers continue to improve and write new plugins for OpenStack, making it easier for enterprises to work with their trusted vendors and take advantage of existing infrastructure. 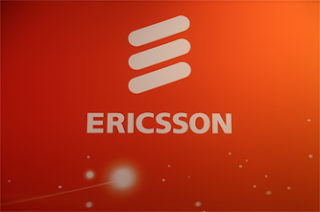 SoftBank Mobile has selected Ericsson's voice over LTE (VoLTE)solution. The network upgrade will support High Definition (HD) voice and video calling, and new enriched multimedia services. Specifically, Ericsson is upgrading SoftBank Mobile's existing mobile core network (Ericsson Mobile Softswitch Solution and Evolved Packet Core) with a complete IMS core, which includes the Multimedia Telephony Application Server (MTAS). SoftBank Mobile's best-in-class Ericsson-based LTE network is also being upgraded with new VoLTE software. Financial terms were not disclosed. Ericsson noted that until nationwide LTE coverage is deployed, seamless handover of ongoing voice calls from LTE to WCDMA is needed to ensure uninterrupted voice services as the user moves out of LTE coverage. Ericsson will also deploy this end-to-end network handover functionality, SRVCC (Single Radio Voice Call Continuity). Qualcomm's Snapdragon 800 processor powers Google's newest Android smartphone, the Nexus 5, which is the first smartphone to be released with global LTE support and Android 4.4 (KitKat). The Nexus 5 also utilizes the Qualcomm's new envelope tracking (ET) technology for 3G/4G LTE devices and offers significant performance improvements, including reduced heat by up to 30 percent and decreased power consumption by up to 20 percent, enabling thinner form factors with longer battery life. The Nexus 5 also will include new Android Camera HAL (Hardware Abstraction Layer) capabilities, which utilizes Qualcomm Technologies' integrated Image Signal Processor and color science algorithms to enable all-new imaging experiences with burst-mode computational photography. The Software Defined Networking (SDN) Market will grow more than six-fold over the next five years, according to a new report from Dell'Oro Group. The majority of this market (75%) will consist of Ethernet switches and network security appliances. "Almost every major Ethernet Switch vendor with exposure in the data center is announcing significant new products over the next several weeks. To put perspective on the order of magnitude of the data center equipment market, in 2013 sales will exceed $100 B, split between Servers, Storage, Ethernet Switches, and Data Center Appliances, etc. We predict a wide variety of manufacturers will engage in battle for the supremacy of data center spending and control," said Alan Weckel, Vice President at Dell'Oro Group. "For Ethernet Switching, data center share will become an increasingly important metric for three reasons: almost all revenue growth in the market over the next five years will come from data center products; vendors will have to fight each other for ever-fewer, although larger, deals; and SDN is changing who owns application and network control points," Weckel stated. The report examines the disruptive elements to the Ethernet Switch market in the data center, including SDN, Cloud, Virtualization, and the impact of White Box Switching. The Report addresses issues such as: the importance of SDN to the data center; the portion of the market attributed to White Box and the effect of the Cloud on Ethernet Switch, Application Delivery Controller and Network Security Appliance Markets. The report also reveals first half 2013 vendor placement in the data center Ethernet Switch market and how Brocade, Cisco, Dell, Hewlett-Packard, Extreme, Huawei, IBM, and Juniper place in this increasingly important segment. 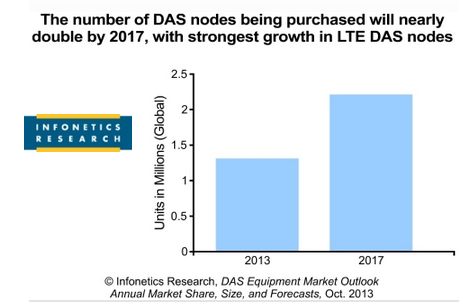 Over 1 million distributed antenna system (DAS) nodes were shipped in 2012, sending worldwide DAS revenue to $1.9 billion — an increase of 4% over 2011, according to a new report from Infonetics. And the market is predicted to continue expanding at a steady rate despite the arrival of small cells. “DAS first became commercially viable in the late 1980s with the advent of optical fiber installed as a transport medium. Since then, the DAS business has been brisk with its lot of boom and bust, growing into a multi-billion dollar market crowded with a flurry of vendor specialists,” explains Stéphane Téral, principal analyst for mobile infrastructure and carrier economics at Infonetics Research. The U.S. and China are the world’s largest DAS markets and are expected to remain so through at least 2017 due to the number and size of their stadiums, convention centers, and transportation stations and ports. 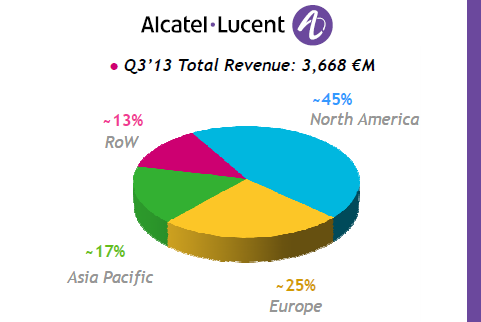 Alcatel-Lucent posted Q3 2013 revenue of Euro 3,668 million, up 7.0% year-on-year at constant exchange rates, and a gross profit of Euro 1,196 million, or 32.6% of revenues, up from 27.8% in Q3 2012. There was a net loss of (group share) of Euro (200) million for the period, or Euro (0.09) per share. This includes restructuring charges of Euro (117) million and other special charges. "We are seeing the first positive signs of our new operating model in our day-to-day business and are encouraged by the substantial progress in the Shift Plan key metrics. Going forward, we remain fully focused on execution to leverage the momentum we are building," stated Michel Combes, CEO of Alcatel-Lucent. The Core Networking segment grew 6.0% year-on-year, driven by a strong performance from IP Routing, and reflecting an improvement in IP Transport, mainly formed by terrestrial and submarine optics, which stabilized after quarters of revenue decline. Revenues for the IP Routing division were Euro 580 million, increasing 7.0% from the year-ago quarter and 14.6% at constant currency, driven by strength in the APAC and EMEA regions, where the latter grew nearly 50% compared to the year-ago quarter. There were four new customers in the quarter for the 7950 XRS core router. Within IP Transport, sales of WDM witnessed a 10% growth in the quarter at constant rate, led by both the Americas and APAC regions. The 1830 Photonic Service Switch represented 38% of optical revenues in the third quarter, and is now deployed with more than 360 customers, including more than 150 100G customers. In the Access segment, both Wireless and Fixed Networks enjoyed a strong performance, driven by broadband roll-outs partially offset by declines in legacy technologies. This is partially offset by the decrease in revenues from Managed Services. Revenues for the Wireless division were Euro 1,196 million, an increase of 12.6% from the year-ago quarter where strong growth in LTE was driven by ongoing investments in the US, in addition to positive trends in both the APAC and EMEA regions. Revenues for the Fixed Networks division were Euro 541 million, an increase of 0.7% from the year-ago quarter on a reported basis and 5.8% at constant currency exchange rate. The VDSL2 vectoring products are now being used by 17 customers, including 4 new contracts in the third quarter. North America posted its second consecutive quarter of nearly 20% year-on-year growth, continuing to be the key driver for the Group. China was stable in terms of revenues, but the rest of the Asia Pacific region declined at a low single digit rate. Encouraging trends continued in Western Europe, growing more than 5%, while Eastern Europe reduced its pace of decline. The recovery in the Middle East and Africa accelerated, witnessing growth in the mid-teens, which was offset by a slowdown in Central and Latin America, resulting in a -9% rate of decline in the Rest of World area. At September 30, 2013, the Group had net debt of Euro (1,004) million, versus Euro (794) million at June 30, 2013. Zain has appointed Ericsson to implement the latest LTE technology and prepaid charging including consulting and systems integration services for its network in Bahrain. Ericsson will replace existing 2G and 3G radio network equipment while adding 4G functionality with the Ericsson RBS 6000 family of base stations. Ericsson will also deploy Evolved Packet Core with triple-access SGSN-MME and Ericsson Evolved Packet Gateway based on Ericsson SSR 8000 family of Smart Services Routers as well as MINI-LINK PT and SP for IP backhaul. Financial terms were not disclosed.